DUTCH ART franked the form of his Prix Morny success with a top-class performance to take the Group One Shadwell Middle Park Stakes in impressive style. The unbeaten Medicean colt stalked the pace after just needing to settle into a rhythm from the stalls for jockey Frankie Dettori. But he picked off Captain Marvelous and Brave Tin Soldier with the minimum of fuss before going on to score easily by two lengths. It was trainer Peter Chapple-Hyam’s first Group One victory in Britain since returning here from Hong Kong for the 2004 season. Chapple-Hyam last won this race in 1991 with Rodrigo Di Triano, who went on to take the following season’s 2000 Guineas at Newmarket. The bookies raced to slash the winner for next year’s 2,000 Guineas with Paddy Power now 8-1 (from 14) and William Hill 9-1 (from 16s), while Coral and Ladbrokes reacted with 10-1 quotes (from 16). Chapple-Hyam said: ”It is a fantastic result. This horse just gets better and better. He has kept growing and improving throughout the year. “I’m sure he will get better. We won’t see the best of him until next year. “He has surprised me. I’ve always thought he was a decent Group horse, but I didn’t think he was the real McCoy until going into the Norfolk Stakes. “He has got an unbelievable turn of foot and he did it quite easily. I’m just sorry that Alan Munro wasn’t here to ride him. “I bought him to be a sharp and early two-year-old. Last year I didn’t really have many two-year-olds, so I thought I better go and buy some sharp ones. As luck would have it, I’ve just happened to have him. “The 2000 Guineas is now his main target. Whether we have a run before I will discuss with his owners Paul and Susan Roy. Dettori said: “He travelled like a good horse and when I asked him to quicken off he went. 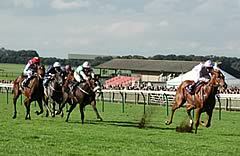 Coventry Stakes hero Hellvelyn is primed for a big run in what promises to be a thrilling renewal of the Group One £170,000 Shadwell Middle Park Stakes at Newmarket on Friday, September 29, 2006. The Bryan Smart-trained two-year-old won his first three starts, including the Royal Ascot Group Two contest over six furlongs in June, before tasting his only defeat when a length and three quarters second to Holy Roman Emperor in the Group One Independent Waterford Wedgewood Phoenix Stakes at The Curragh on August 13, with Group One winner Miss Beatrix in third. Smart revealed today: "I couldn't be more pleased with him and he's going to Newmarket in good order. I'm hoping for a big run in what looks to be a very competitive race. He deserves to be there and he owes us nothing. "I was obviously a bit disappointed he got beat last time but, if anything, I think my horse was a little bit free that day and the form is solid." The North Yorkshire handler is keeping his options open regarding the future with the Sheikh Rashid-owned son of Ishiguru. Smart reported: "He's in the Darley Dewhurst Stakes so that's a possibility, but obviously we'll have to discuss with Sheikh Rashid what happens after this race. The horse has done it on all sorts of ground so I wouldn't be concerned on that score." The prestigious six-furlong contest has attracted a typically high-class field of six, which includes the Peter Chapple-Hyam-trained Dutch Art, unbeaten in three starts including the Group Two Norfolk Stakes at Royal Ascot and the Group One Darley Prix Morny at Deauville. Conquest, trained by William Haggas, landed the six-furlong Group Two Scottish Equitable Gimcrack Stakes at York in August by three quarters of a length from Wi Dud. The field is completed by the well-regarded Aidan O'Brien-trained Listed winner Brave Tin Soldier, and the progressive Barry Hills-trained Captain Marvelous.